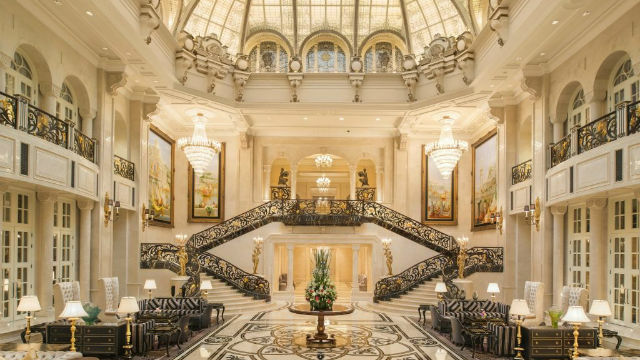 Starwood Hotels & Resorts opens an amazing luxury castle hotel in China. The Luxury Collection, part of Starwood Hotels & Resorts Worldwide, Inc., has announced the opening of the stunning Castle Hotel on China’s northern coast. A beautiful icon on Dalian’s skyline, the castle overlooks the Xinghai Square as well as Xinghai Bay and the Yellow Sea, and is the first Luxury Collection hotel to open in Liaoning. The Castle Hotel offers 292 luxurious guestrooms and suites as well as 67 residences. It features three restaurants, a grand ballroom, rooftop garden, indoor swimming pool and luxurious Kaiser Spa. ‘We are delighted to open the doors of The Castle Hotel as the first Luxury Collection hotel in Dalian,’ says Mr Eddie Tang, General Manager of The Castle Hotel. ‘It has been our pleasure and honour to transform this enduring icon into a unique and enchanting luxury hotel – unlike any other in China.